Exercise is a key factor of optimal health; it's particularly important for controlling your blood sugar and normalizing your insulin levels. I often recommend viewing exercise as a drug that needs to be properly prescribed and "taken" at a proper dosage. When done correctly, exercise can oftentimes act as a substitute for some of the most common drugs used today for things like diabetes, heart disease and depression. All of these conditions will improve with exercise and the help of an experienced natural health care clinician. High intensity interval training (HIIT), which is a core component of my Peak Fitness program, is key for reaping optimal results from exercise. There are many versions of HIIT, but the core premise involves maximum exertion followed by a quick rest period for a set of intervals. My Peak Fitness routine uses a set of eight 30-second sprints, each followed by 90 seconds of recovery, as taught by Phil Campbell who is a pioneer in this field. Also, while I typically recommend using an elliptical machine or recumbent bike, you can just as easily perform a high intensity routine without any equipment at all. A recent article in the American College of Sports Medicine’s Health & Fitness Journal1 shows how you can fulfill the requirements for a high intensity exercise using nothing more than your own body weight, a chair, and a wall. 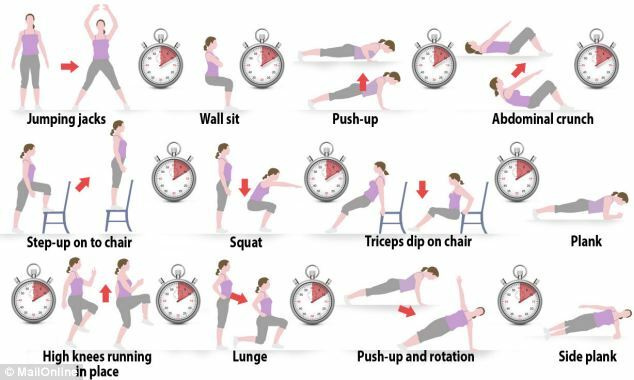 Best of all, this science-backed routine only requires a seven minute investment, as the program calls for as little as 10- to 15-seconds of rest between each 30-second exercise, which should be performed in rapid succession. One of the added boons of this 7-minute program is that since you don’t need any equipment, you can easily take this routine with you when traveling. You’d be hard-pressed to find a hotel room that doesn’t at least have a chair in it. When done at the appropriate intensity, which should hover around 8 on a scale of 1-10, the following 12 exercises, which are outlined in the report, equate to doing a long run and a weight-training session. The exercises are ideally done in the following order, as this allows for opposing muscle groups to alternate between resting and working in each subsequent exercise. “Because of the elevated demand for exercise intensity in high intensity circuit training protocols, caution should be taken when prescribing this protocol to individuals who are overweight/obese, detrained, previously injured, or elderly or for individuals with comorbidities. For individuals with hypertension or heart disease, the isometric exercises (wall sit, plank, and side plank) are not recommended. The isometric exercises can be substituted with dynamic exercises. I firmly believe that most people would benefit from high intensity exercises but the key is to start very slowly if you have any of the risk factors listed above. You might actually require several months to work up to a high intensity level. But as long as you start at a safe level and continue to push yourself to progressively higher levels, you will eventually reach a level of intensity that will provide the benefits. Remember, while your body needs regular amounts of stress like exercise to stay healthy, if you give it more than you can handle your health can actually deteriorate. So it’s crucial to listen to your body and integrate the feedback into your exercise intensity and frequency. When you work out, it is wise to really push as hard as you possibly can a few times a week, but you do need to wisely gauge your body's tolerance to this stress. Contrary to popular belief, extended extreme cardio, such as marathon running, actually sets in motion inflammatory mechanisms that damage your heart. So while your heart is indeed designed to work very hard, and will be strengthened from doing so, it’s only designed to do so intermittently, and for short periods—not for an hour or more at a time. This is the natural body mechanics you tap into when you perform HIIT. What Makes HIIT so Effective? Your body has three types of muscle fibers: slow, fast, and super-fast twitch muscles. Slow twitch muscles are the red muscles, which are activated by traditional strength training and cardio exercises. The latter two (fast and super-fast) are white muscle fibers, and these are only activated during high intensity interval exercises or sprints. The benefit of activating these fibers is that they will produce therapeutic levels of growth hormone, which many athletes spend over a $1,000 a month to inject themselves with. So there is no need to pay the money or take the risks when your body can produce growth hormone naturally through high intensity exercises. Strength Training: If you want, you can increase the intensity by slowing it down. You need enough repetitions to exhaust your muscles. The weight should be heavy enough that this can be done in fewer than 12 repetitions, yet light enough to do a minimum of four repetitions. It is also important NOT to exercise the same muscle groups every day. They need at least two days of rest to recover, repair and rebuild. For more information about using super slow weight training as a form of high-intensity interval exercise, please see my interview with Dr. Doug McGuff. Exercise programs like Pilates, yoga, and Foundation Training are great for strengthening your core muscles, as are specific exercises you can learn from a personal trainer. Stretching: My favorite type of stretching is Active Isolated Stretching (AIS) developed by Aaron Mattes. With AIS, you hold each stretch for only two seconds, which works with your body's natural physiological makeup to improve circulation and increase the elasticity of muscle joints. This technique also allows your body to repair itself and prepare for daily activity. You can also use devices like the Power Plate to help you stretch.